This premium 1-ply toilet paper requires fewer roll changes than standard 2-ply rolls. Each roll is individually wrapped for hygienic storage. Ideal for all office sizes. 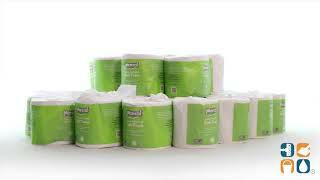 Marcal's recycled toilet tissues are septic safe and ideal for those concerned with preserving the environment. White. Each roll has 1,000 sheets. Includes 40 rolls.